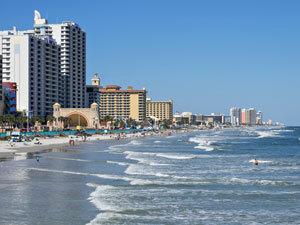 Daytona Beach is famous for its hard sand beaches and is home to over 60,000 people. The economy is backed by tourism and this fact allows you to target your audience with effective advertising. Some of the more notable locations where out-of-home advertisements can be utilized are Volusia Mall and Ocean Walk Shoppes. Another outdoor advertisement option is near one of the many museums in the city. The Museum of Arts and Sciences would be one great example. Billboards on I-4 or I-95 would also generate high traffic exposure of your business. Zip Codes: 32114, 32115, 32116, 32117, 32118, 32119, 32120, 32121, 32122, 32123, 32124, 32125, 32126, 32127, 32198.